This article is about the military conflict. For the terrorist organization, see Black September Organization. For other uses, see Black September (disambiguation). Smoke rises over Amman during clashes between the Jordanian army and the fedayeen, 1 October 1970. 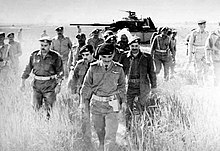 Black September (Arabic: أيلول الأسود‎; Aylūl Al-Aswad) was a conflict fought in Jordan between the Jordanian Armed Forces (JAF), under the leadership of King Hussein, and the Palestine Liberation Organisation (PLO), under the leadership of Yasser Arafat, primarily between 16 and 27 September 1970, with certain actions continuing until 17 July 1971. After Jordan lost control of the West Bank to Israel in 1967, Palestinian fighters known as fedayeen moved their bases to Jordan and stepped up their attacks on Israel and Israeli-occupied territories. One Israeli retaliation on a PLO camp based in Karameh, a Jordanian town along the border with the West Bank, developed into a full-scale battle. The perceived joint Jordanian-Palestinian victory in the 1968 Battle of Karameh led to an upsurge in Arab support for the Palestinian fighters in Jordan. The PLO's strength in Jordan grew, and by the beginning of 1970, groups within the PLO had started to openly call for the overthrow of the Hashemite monarchy. Acting as a state within a state, the fedayeen disregarded local laws and regulations, and even attempted to assassinate King Hussein twice—leading to violent confrontations between them and the Jordanian army in June 1970. Hussein wanted to oust the fedayeen from the country, but hesitated to strike because he did not want his enemies to use it against him by equating Palestinian fighters with civilians. PLO actions in Jordan culminated in the Dawson's Field hijackings incident of 6 September, in which the fedayeen hijacked three civilian aircraft and forced their landing in Zarqa, taking foreign nationals as hostages, and later blowing up the planes in front of international press. Hussein saw this as the last straw, and ordered the army to move. On 17 September, the Jordanian army surrounded cities with a PLO presence including Amman and Irbid, and began shelling the fedayeen, who had established themselves in Palestinian refugee camps. The next day, a Syrian force, with Palestine Liberation Army markings, intervened in support of the fedayeen. It advanced towards Irbid which the fedayeen had declared a "liberated" city. On 22 September, the Syrians withdrew from Irbid after the Jordanian army launched an air-ground offensive that inflicted heavy Syrian losses. Pressure mounted by Arab countries led Hussein to halt the fighting. On 13 October he signed an agreement with Arafat to regulate the fedayeen's presence. However, the Jordanian army attacked again in January 1971. The fedayeen were driven out of the cities, one by one, until 2,000 fedayeen surrendered after being surrounded in a forest near Ajloun on 17 July, marking the end of the conflict. Jordan allowed the fedayeen to leave for Lebanon via Syria, and the fedayeen later participated in the 1975 Lebanese Civil War. The Black September Organization was founded after the conflict to carry out reprisals against the Jordanian authorities. The organization's first attack was the assassination in 1971 of Wasfi Tal, the then Jordanian Prime Minister who had commanded parts of the operation that expelled the fedayeen. The organization then shifted to attacking Israeli targets, including the highly publicized 1972 Munich massacre of Israeli athletes. After Jordan annexed the West Bank in 1951, it conferred its citizenship on the West Bank Palestinians. The combined population of the West Bank and Jordan consisted of two-thirds Palestinians (one-third in the West Bank and one-third in the East Bank) and one-third Jordanians. Jordan provided Palestinians with seats amounting to half the parliament and Palestinians enjoyed equal opportunities in all sectors of the state. This demographic change influenced Jordanian politics. King Hussein considered that the Palestinian problem would remain the country's overriding national security issue; he feared an independent West Bank under PLO administration would threaten the autonomy of his Hashemite kingdom. The Palestinian factions were supported variously by many Arab governments, most notably Egypt's President Gamal Abdel Nasser, who gave them political support. The Palestinian nationalist organization Fatah started organizing cross-border attacks against Israel in January 1965, often drawing severe Israeli reprisals upon Jordan. The Samu Incident launched by Israel on 13 November 1966 was one such reprisal, after three Israeli soldiers were killed by a Fatah landmine. The Israeli assault on the Jordanian controlled West Bank town of As-Samu inflicted heavy casualties on Jordan. Israeli writer Avi Shlaim argued that Israel's disproportionate retaliation exacted revenge on the wrong party, as Israeli leaders knew from their interaction with Hussein that he was doing everything he could to prevent such attacks. Hussein, who felt he had been betrayed by the Israelis, drew fierce local criticism because of this incident. It is thought that this contributed to his decision to join Egypt and Syria's war against Israel in 1967. In June 1967 Israel captured the West Bank from Jordan during the Six-Day War. After Jordan lost the West Bank, Fatah under the PLO stepped up their guerrilla attacks against Israel from Jordanian soil, making the border town of Karameh their headquarters. On 18 March 1968, an Israeli school bus was blown up by a mine near Be'er Ora in the Arava, killing two adults and wounding ten children—the 38th Fatah operation in little more than three months. 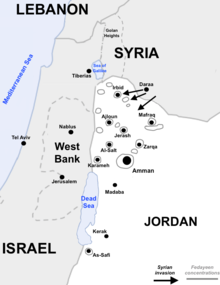 On 21 March, Israel Defense Forces (IDF) units entered Jordan and launched a reprisal attack on Karameh that developed into a full-scale battle that lasted a day. The PLO suffered some 200 casualties and another 150 taken prisoner; 40–84 Jordanian soldiers were also killed. Israeli losses stood at around 30 killed and 69–161 wounded, and they also left behind several vehicles. King Hussein after checking an abandoned Israeli tank on 21 March 1968 during the Battle of Karameh. The perceived joint Palestinian-Jordanian victory led to an upsurge in support for the fedayeen in Jordan. Both sides declared victory: Israel had fulfilled its objective of destroying the Karameh camp, but failed to capture Arafat, while Jordan and the PLO had exacted relatively heavy Israeli casualties. Although the Palestinians had limited success in inflicting Israeli casualties, King Hussein let them take the credit. The fedayeen used the battle's wide acclaim and recognition in the Arab world to establish their national claims. The Karameh operation also highlighted the vulnerability of bases close to the Jordan River, so the PLO moved them farther into the mountains. Further Israeli attacks targeted Palestinian militants residing among the Jordanian civilian population, giving rise to friction between Jordanians and guerrillas. Palestinians and Arabs generally considered the battle a psychological victory over the IDF, which had been seen as "invincible" until then, and recruitment into guerilla units soared. Fatah reported that 5,000 volunteers had applied to join within 48 hours of the events at Karameh. By late March, there were nearly 20,000 fedayeen in Jordan. Iraq and Syria offered training programs for several thousand guerrillas. The Persian Gulf states, led by Kuwait, raised money for them through a 5% tax on the salaries of their tens of thousands of resident Palestinian workers, and a fund drive in Lebanon raised $500,000 from Beirut alone. The Palestinian organizations also began to guarantee a lifetime support for the families of all guerrillas killed in action. Within a year after the battle, Fatah had branches in about eighty countries. After the battle, Fatah gained control of the PLO in Egypt. Palestinian fedayeen from Syria and Lebanon started to converge on Jordan, mostly in Amman. In Palestinian enclaves and refugee camps in Jordan, the police and army were losing their authority. The Wehdat and Al-Hussein refugee camps came to be referred as "independent republics" and the fedayeen established administrative autonomy by establishing local government under the control of uniformed PLO militants—setting up checkpoints and attempting to extort "taxes" from civilians. 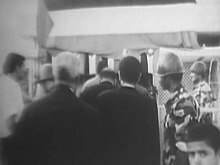 In early November 1968, the Jordanian army attacked a fedayeen group named "Al-Nasr" (meaning victory) after the group had attacked Jordanian police. Not all Palestinians were supportive of Al-Nasr's actions, but the Jordanian response was meant to send a message that there would be consequences for challenging the government's authority. Immediately after the incident, a seven-point agreement was reached between King Hussein and Palestinian organizations, that restrained unlawful and illegal fedayeen behavior against the Jordanian government. The PLO would not live up to the agreement, and came to be seen more and more as a state within a state in Jordan. Fatah's Yasser Arafat replaced Ahmad Shukeiri as the PLO's leader in February 1969. Discipline in the different Palestinian groups was poor, and the PLO had no central power to control the different groups. A situation developed of fedayeen groups rapidly spawning, merging, and splintering, sometimes trying to behave radically in order to attract recruits. Hussein went to the United States in March 1969 for talks with Richard Nixon, the new American president. He argued for Israel's adherence to United Nations Security Council Resolution 242, in which it was required to return territories it had occupied in 1967 in return for peace. Palestinian factions were suspicious of Hussein, as this meant the withdrawal of his policy of forceful resistance towards Israel, and these suspicions were further heightened by Washington's claim that Hussein would be able to liquidate the fedayeen movement in his country upon resolution of the conflict. Fatah favored not intervening in the internal affairs of other Arab countries. However, although it assumed the leadership of the PLO, more radical left-wing Palestinian movements refused to abide by that policy. 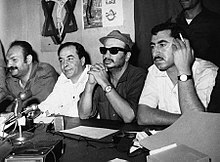 By 1970, the Popular Front for the Liberation of Palestine (PFLP) led by George Habash and the Democratic Front for the Liberation of Palestine (DFLP) led by Nayef Hawatmeh, began to openly question the legitimacy of the Hashemite monarchy, and called for its overthrow and replacement with a revolutionary regime. Other radical left-wing groups included the Syrian Ba'ath's As-Sa'iqa, and the Iraqi Ba'ath's Arab Liberation Front: these saw Hussein as "a puppet of Western imperialism", " a reactionary", and "a Zionist tool". They claimed that the road to Tel Aviv passed through Amman, which they sought to transform into the Hanoi of Arabia. They also stirred up conservative and religious feelings with provocative anti-religious statements and actions, such as putting up Marxist and Leninist slogans on mosque walls. They drove noisily around Amman in jeeps with loaded weapons, like an army of occupation; they extorted financial contributions from individuals, sometimes foreigners, in their homes and in public places; they disregarded routine traffic regulations, failed to register and license their vehicles, and refused to stop at army checkpoints; they boasted about their role of destiny against Israel and belittled the worth of the army. Their very presence in Amman, far from the battlefield, seemed like a challenge to the regime. Palestinians claimed there were numerous agents provocateurs from Jordanian or other security services present among the fedayeen, deliberately trying to upset political relations and provide justification for a crackdown. There were frequent kidnappings and acts of violence against civilians: Chief of the Jordanian Royal Court (and subsequently Prime Minister) Zaid al-Rifai claimed that in one extreme instance "the fedayeen killed a soldier, beheaded him, and played football with his head in the area where he used to live". The situation placed Hussein in a severe dilemma: if he used force to oust the fedayeen, he would alienate himself from the Palestinians in the country and the Arab World. However, if he refused to act to strike back at the fedayeen, he would lose the respect of Jordanians, and more seriously, that of the army, the backbone of the regime, which already started to pressure Hussein to act against them. In February 1970, King Hussein visited Egyptian President Nasser in Cairo, and won his support for taking a tougher stance against the fedayeen. Nasser also agreed to influence the fedayeen to desist from undermining Hussein's regime. Upon his return, he published a ten-point edict restricting activities of the Palestinian organizations, which included prohibition of the following: carrying arms publicly, storing ammunitions in villages, and holding demonstrations and meetings without prior governmental consent. The fedayeen reacted violently to these efforts aimed at curbing their power, which led Hussein to freeze the new regulation; he also acquiesced to fedayeen demands of dismissing the perceived anti-Palestinian interior minister Muhammad Al-Kailani. Hussein's policy of giving concessions to the fedayeen was to gain time, but Western newspapers started floating sensationalized stories that Hussein was losing control over Jordan and that he might abdicate soon. Libya, Saudi Arabia and Kuwait, who were openly supporting the fedayeen, sent Jordan financial subsidies, placing Hussein in a difficult position. Hussein saw no external forces to support him other than the United States and Israel, but that would act as fuel for fedayeen propaganda against him. On 17 February 1970, the American embassy in Tel Aviv relayed three questions from Hussein to Israel asking about Israel's stance if Jordan chose to confront the fedayeen. Israel replied positively to Hussein, and committed that they would not take advantage if Jordan withdrew its troops from the borders for a potential confrontation. Israeli artillery and airforce attacked Irbid on 3 June as reprisal for a fedayeen attack on Beit Shean, killing one soldier, as well as killing seven and injuring twenty-six civilians. The Jordanian army retaliated and shelled Tiberias for the first time in 22 years; Hussein ordered the shelling but realized it was the start of a dangerous cycle of violence. Consequently, he requested, through the American embassy in Amman, a ceasefire with the Israelis to buy time so that he could take strong measures against the fedayeen. The message to Israel stated that "the Jordanian government was doing everything it could to prevent fedayeen rocket attacks on Israel. King deeply regrets the rocket attacks. Jordan Army under orders to shoot to kill any fedayeen attempting to fire rockets and fedayeen leaders had been told again evening of June 3 that violators would be shot on sight". Israel accepted Hussein's request following pressure from the Americans. In the summer of 1970, the Jordanian army was on the verge of losing its patience with the fedayeen. After a provocation from the fedayeen, a tank battalion moved from the Jordan Valley without orders from Amman, intending to retaliate against them. It took the personal intervention of Hussein and that of the 3rd Armored Division commander Sharif Shaker, who blocked the road with their cars, to stop its onslaught. Fighting broke out again between the fedayeen and the army in Zarqa on 7 June. Two days later, the fedayeen opened fire on the General Intelligence Directorate's (mukhabarat) headquarters. Hussein went to visit the mukhabarat headquarters after the incident, but his motorcade came under heavy fedayeen fire, killing one of his guards. Bedouin units of the army retaliated for the assassination attempt against their king by shelling Al-Wehdat and Al-Hussein camps, which escalated into a conflict that lasted three days. An Israeli army meeting deliberated on events in Jordan; according to the director of Israel's Military Intelligence, there were around 2,000 fedayeen in Amman armed with mortars and Katyusha rockets. Hussein's advisors were divided: some were urging him to finish the job, while others were calling for restraint as victory could only be accomplished at the cost of thousands of lives, which to them was unacceptable. Hussein halted the fighting, and the three-day conflict's toll was around 300 dead and 700 wounded, including civilians. The authority and prestige of the Hashemite regime will continue to decline. The international credibility of Jordan will be further compromised... Greater fedayeen freedom of action will inevitably result in more serious breaches of the ceasefire in the Jordan Valley... Hussein faces an uncertain political future. June 1970 became one of the most uncertain periods for the Hashemite monarchy in Jordan, as most foreign diplomats believed that events favored the fedayeen, and that the downfall of the monarchy was just a matter of time. Although Hussein was confident, members of his family started to wonder for how long the situation would last. 72-year old Prince Zeid bin Hussein – the only son of Hussein bin Ali (Sharif of Mecca) that did not become a king – was visiting Amman in June and stayed with Hussein in the royal palace. He saw Hussein's management of the affair, and before he left, told his son that he thought Hussein to be the "most genuine, able and courageous Hashemite he had ever met", as well as "the greatest leader among all the Hashemite kings." Another ceasefire agreement was signed between Hussein and Arafat on 10 July. It recognized and legitimized fedayeen presence in Jordan, and established a committee to monitor fedayeen conduct. The American-sponsored Rogers Plan for the Israeli–Palestinian conflict was publicized in July—based on Security Council Resolution 242. Nasser and Hussein accepted the plan, but Arafat rejected it on 26 July, claiming that it was a device to liquidate his movement. The PFLP and DFLP were more uncompromising, vehemently rejecting the plan and denouncing Nasser and Hussein. Meanwhile, a ceasefire was reached between Egypt and Israel on 7 August, formally ending the War of Attrition. On 15 August, Arafat was alleged to have said that "we have decided to convert Jordan into a cemetery for all conspirators—Amman shall be the Hanoi of the revolution." Paradoxically, Arafat had cautioned Habash and Hawatmeh, the respective leaders of the PFLP and the DFLP, from provoking the regime, as it enjoyed military superiority and could terminate their existence in Jordan at any time. But his calls went unheeded, and they started to call more openly for the overthrow of the Hashemites as a "prelude to the launching of a popular war for the liberation of Palestine." Another engagement between the army and the fedayeen occurred at the end of August, after the fedayeen ambushed army vehicles and staged an armed attack on the capital's post office. 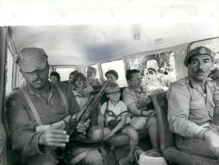 Jordanian army unit escorts rescued family back to Amman, 9 September 1970. Hussein's motorcade came under fire on 1 September for the second time in three months, triggering clashes between the army and the fedayeen in Amman up until 6 September. 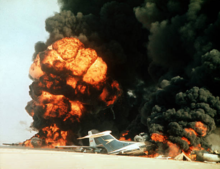 On 6 September, three planes were hijacked by the PFLP: SwissAir and TWA jets that landed at Azraq, Jordan, and a Pan Am jet that was flown to Cairo and immediately blown up after passengers were deplaned. The two jets that landed in Jordan had 310 passengers; the PFLP threatened to blow them up if fedayeen from European and Israeli prisons were not released. On 9 September, a third plane was hijacked to Jordan: a BOAC flight from Bahrain with 115 passengers was diverted to Zarqa. The PFLP announced that the hijackings were intended "to bring special attention to the Palestinian problem". After 371 hostages were removed, the planes were dramatically blown up in front of international press on 12 September. However, 54 hostages were kept by the organization for around two weeks. Arab regimes and Arafat were not pleased with the hijackings; the latter considered them to have caused more harm to the Palestinian issue. But Arafat could not dissociate himself from the hijackings, again because of Arab public opinion. Al-Jazy, the perceived pro-Palestinian newly appointed army chief of staff, resigned on 9 September in the midst of the hijacking crisis, and was replaced by Habis Al-Majali, who was brought in from retirement. Natheer Rasheed, the intelligence director who had been appointed a month earlier, claimed that Al-Jazy was paid 200,000 Jordanian dinars, and that his resignation letter was written by the PLO. Shlaim claims that the prelude consisted of three stages: "conciliation, containment and confrontation". He argues that Hussein was patient so that he could demonstrate that he had done everything he could to avoid bloodshed, and that confrontation only came after all other options had been exhausted, and after public opinion (both international and local) had tipped against the fedayeen. On the evening of 15 September, Hussein called in his advisors for an emergency meeting at his Al-Hummar residence on the western outskirts of Amman. Amer Khammash, Habis Al-Majali, Sharif Shaker, Wasfi Tal, and Zaid al-Rifai were among those who were present; for some time they had been urging Hussein to sort out the fedayeen. The army generals estimated that it would take two or three days for the army to push the fedayeen out of major cities. Hussein dismissed the civilian government the following day and appointed Muhammad Daoud, a Palestinian loyalist to head a military government, thereby declaring martial law. Other Palestinians in the military government included figures like Adnan Abu Oudeh, an officer in the mukhabarat. Abu Oudeh later asked Hussein what the most difficult decision was that he had to make, to which the king replied: "The decision to recapture my capital." On 17 September, the 60th Armoured Brigade entered the capital Amman from different directions and shelled the Wehdat and Hussein refugee camps where the fedayeen were based with tanks, artillery and mortars. The fedayeen put up a stiff resistance as they were well prepared, and the fighting lasted the next ten days without break. Simultaneously, the army surrounded and attacked other fedayeen-controlled cities including: Irbid, Jerash, Al-Salt and Zarqa. The three days estimated by Hussein's generals could not be achieved, and the ensuing stalemate led Arab countries to step up pressure on Hussein to halt the fighting. Jordan feared foreign intervention in the events in support of the fedayeen; this soon materialized on 18 September after a force from Syria with Palestine Liberation Army (PLA) markings marched towards Irbid, which the fedayeen had declared a "liberated" city. The 40th Armoured Brigade managed to block the Syrian forces' advance after heavy fighting. A second, much larger, Syrian incursion occurred on the same day: it consisted of two armored and one mechanized infantry brigades of the 5th Infantry Division, and around 300 tanks. Although the Syrian tanks had PLA markings, the troops were Syrian Army regulars. Syria issued no statement regarding the situation, but it is believed that the purpose of its intervention was to help the fedayeen overthrow the monarchy. Another tentative explanation is that the Syrians wanted to create a haven for the fedayeen in northern Jordan, from where they could negotiate with Hussein. There were also concerns of Iraqi interference. A 17,000 man 3rd Armoured Division of the Iraqi Army had remained in eastern Jordan since after the 1967 Six-Day War. The Iraqi government sympathized with the Palestinians, but it was unclear whether the division would get involved in the conflict in favor of the fedayeen. Thus, the Jordanian 99th Brigade had to be detailed to monitor the Iraqis. We were in the middle of the shelling since Ashrafiyeh was among the Jordanian Army's primary targets. Electricity was cut off, and again we had little food or water. Friday afternoon, we heard the metal tracks of a tank clanking on the pavement. We were quickly herded into one room, and the guerrillas threw open the doors to make the building appear abandoned so it wouldn't attract fire. Suddenly, the shelling stopped. Hussein arranged a cabinet meeting on the evening of the Syrian incursion, leaving them to decide if Jordan should seek foreign intervention. Two sides emerged from the meeting; one group of ministers favored military intervention from the United Kingdom or the United States, while the other group argued that it was an Arab affair that ought to be dealt with internally. The former group prevailed as Jordan was facing an existential threat. Britain refused to interfere militarily for fear of getting involved in a region-wide conflict; arguments such as "Jordan as it is is not a viable country" emerged. The British cabinet then decided to relay the Hussein's request to the Americans. Nixon and Kissinger were receptive to Hussein's request. Nixon ordered the U.S. Navy's 6th Fleet to be positioned off the coast of Israel, near Jordan. By 19–20 September, the U.S. Navy had concentrated a powerful force in the Eastern Mediterranean. Its official mission was to protect American interests in the region and to respond to the capture of about 54 British, German, and U.S. citizens in Jordan by PLO forces. Later, declassified documents showed that Hussein called an American official at 3 a.m. to request American intervention. "Situation deteriorating dangerously following Syrian massive invasion", Hussein was quoted. "I request immediate physical intervention both land and air... to safeguard sovereignty, territorial integrity and independence of Jordan. Immediate air strikes on invading forces from any quarter plus air cover are imperative." On 22 September, Hussein ordered the Royal Jordanian Air Force (RJAF) to attack the Syrian forces. A joint air-ground offensive proved successful, contributing to the success was the Syrian Air Force's abstention from joining. This has been attributed to power struggles within the Syrian Ba'athist government between Syrian President Salah Jadid and Syrian Air Force commander Hafez Al-Assad. Al-Assad claimed power after a coup on 13 November. Iraqi impartiality was attributed to Iraqi general Hardan Al-Tikriti's commitment to Hussein not to interfere—he was assassinated a year later for this. It is thought that the rivalry between the Iraqi and Syrian Ba'ath Party was the real reason for Iraqi non-involvement. Egyptian President Gamal Abdel Nasser brokering a ceasefire between Yasser Arafat and King Hussein at the emergency Arab League summit in Cairo on 27 September 1970. Nasser died the following day of a heart attack. The airstrikes inflicted heavy losses on the Syrians, and on the late afternoon of 22 September, the 5th Division began to retreat. The Israeli Air Force flew symbolically over the Syrian units in support of Hussein, but did not engage. Jordanian forces steadily shelled the fedayeen's headquarters in Amman, and threatened to also attack them in other regions of the country. The Palestinians suffered heavy losses, and some of their commanders were captured. On the other hand, in the Jordanian army there were around 300 defections. Hussein agreed to a cease-fire after Arab media started accusing him of massacring the Palestinians. Jordanian Prime Minister Muhammad Daoud defected to Libya after being pressured by President Muammar Al-Gaddafi, while the former was in Egypt representing Jordan at an emergency Arab League summit. Hussein himself decided to fly to Cairo on 26 September, where he was met with hostility from Arab leaders. On 27 September, Hussein and Arafat signed an agreement brokered by Egyptian President Nasser. Nasser died the following day of a heart attack. The Jordanian army regained control of key cities and intersections in the country before accepting the ceasefire agreement brokered by Egypt's Nasser. Hussein appointed a Palestinian, Ahmad Toukan, as prime minister, instructing him to "bandage the wounds". In the period following the ceasefire, Hussein publicly revealed that the Jordanian army had uncovered around 360 underground PLO bases in Amman, and that Jordan held 20,000 detainees, among whom were "Chinese advisors". The head of a Pakistani training mission to Jordan, Brigadier Muhammad Zia-ul-Haq (later Chief of Army Staff and President of Pakistan), was involved on the Jordanian side. Zia had been stationed in Amman for three years prior to Black September. During the events, according to CIA official Jack O'Connell, Zia was dispatched by Hussein north to assess Syria's military capabilities. The Pakistani commander reported back to Hussein, recommending the deployment of a RJAF squadron to the region. [i] O'Connell also said that Zia personally led Jordanian troops during the battles. 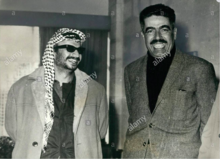 Two Iranian leftist guerilla organizations, the Organization of Iranian People's Fedai Guerrillas (OIPFG) and the People's Mujahedin of Iran (PMOI), were involved in the conflict against Jordan. Their "collaboration with the PLO was particularly close, and members of both movements even fought side by side in Jordan during the events of Black September and trained together in Fatah camps in Lebanon". On 3 August 1972, PMOI operatives bombed the Jordanian embassy in Tehran during King Hussein's state visit as an act of "revenge" for the events of Black September. Arafat claimed that the Jordanian army killed 25,000 Palestinians—other estimates put the number at between 2,000 and 3,400. The Syrian invasion attempt ended with 120 tanks lost, and around 600 Syrian casualties. Jordanian soldiers suffered around 537 dead. Wasfi Tal (right) with Yasser Arafat (left) on 12 December 1970 during ceasefire negotiations. Premier Tal was assassinated on 28 November 1971 in Egypt by the Black September Organization. Another agreement – called the Amman agreement – was signed between Hussein and Arafat on 13 October. It mandated that the fedayeen respect Jordanian sovereignty and desist from wearing uniforms or bearing arms in public. However it contained a clause requiring that Jordan recognize the PLO as the sole representative of the Palestinians; Wasfi Tal rejected this clause. Habash and Hawatmeh continued their attacks on the monarchy in spite of the Amman agreement. Hussein appointed Tal to form a government. Tal was seen as anti-Palestinian, however he had made pro-Palestinian gestures during his previous two tenures as prime minister. Tal viewed Arafat with suspicion as he considered that the PLO concentrated its efforts against the Jordanian state rather than against Israel. On one occasion, Tal lost his temper and shouted at Arafat "You are a liar; you don't want to fight Israel!". Shlaim describes Tal as a more uncompromising figure than Hussein, and very popular with the army. Clashes between the army, and the PFLP and DFLP, ensued after Tal was instated. Tal launched an offensive against fedayeen bases along the Amman-Jerash road in January 1971, and the army drove them out of Irbid in March. In April, Tal ordered the PLO to relocate all its bases from Amman to the forests between Ajloun and Jerash. The fedayeen initially resisted, but they were hopelessly outnumbered and outgunned. In July, the army surrounded the last remaining 2,000 fedayeen from the Ajloun-Jerash area. The fedayeen finally surrendered and were allowed to leave to Syria—some 200 fighters preferred to cross the Jordan River to surrender to Israeli forces rather than to the Jordanians. At a 17 July press conference, Hussein declared that Jordanian sovereignty had been completely restored, and that there "was no problem now". In the wake of the conflict, the new civilian government of Tal began a wide-scale purge of the government's bureaucracy and military, freeing them from any supporters of guerrilla warfare. This effectively means that large numbers of Palestinian officers, bureaucrats and a number of residents of eastern Jordan have been expelled from their jobs. This was accompanied by a war of Tal on the newspapers and massive arrests of the government against the "saboteurs". Many newspapers have been closed and their permits withdrawn and their Palestinian editors rejected. The events proved to be decisive in the history of Jordan; it witnessed the emergence of a distinct Jordanian identity. Hussein's resilience in the face of the joint Palestinian-Syrian challenge impressed both the West and Israel. Nixon ordered $10 million in aid to be delivered to Jordan, and another $30 million requested from Congress. A group of fedayeen surrendering to Israeli forces after having fled across the Jordan River, 21 July 1971. The Black September Organization was established by Fatah members in 1971 for reprisal operations and international strikes after the September events. On 28 November 1971, four of the group's members assassinated Prime Minister Wasfi Tal in the lobby of the Sheraton Cairo Hotel in Egypt while he was attending an Arab League summit. The group would go on to perform other strikes against Jordan, and against Israeli and Western citizens and property outside of the Middle East, such as the Munich massacre against Israeli athletes in 1972. The Black September Organization was later disbanded in 1973–1974 as the PLO sought to exploit the Yom Kippur War of 1973 and pursue a diplomatic strategy. Fatah has always publicly denied its responsibility for Black September operations, but by the 2000s, some high-ranking Fatah and Black September officials acknowledged the relationship. In the September fighting, the PLO lost its main base of operations. Fighters were driven to Southern Lebanon where they regrouped. The enlarged PLO presence in Lebanon and the intensification of fighting on the Israeli–Lebanese border stirred up internal unrest in Lebanon, where the PLO fighters added dramatically to the weight of the Lebanese National Movement, a coalition of Muslims, Arab nationalists and leftists who opposed the rightist, Maronite-dominated government. These developments helped precipitate the Lebanon Civil War, in which the PLO would ultimately be expelled to Tunisia. This page is based on the Wikipedia article Black September; it is used under the Creative Commons Attribution-ShareAlike 3.0 Unported License (CC-BY-SA). You may redistribute it, verbatim or modified, providing that you comply with the terms of the CC-BY-SA.